Hydropower Licensing, Relicensing, and Compliance - Meridian Environmental, Inc.
Meridian has been a contractor to the FERC since 1998, conducting over 25 NEPA environmental analyses for hydroelectric and hydrokinetic projects throughout the United States. Our work involves reviewing license applications and other applicant filings to ensure compliance with the FERC regulations and policies and preparing EISs and EAs. We address issues such as fish passage, instream flows, ramping rates, entrainment, reservoir fluctuation, bank stability, instream and riparian habitat quality, invasive plant management, wetlands and old-growth, wildlife movement and migration, listed species, land use, recreation, aesthetics, grazing, and shoreline management. 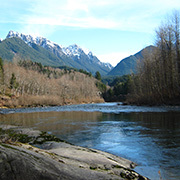 The Sunset Fish Passage and Energy Project is a proposed 30-MW run-of-river hydropower project on the South Fork Skykomish River. Meridian has been providing licensing services to the District for the project since 2012. Tasks have included preparing the Pre-Application Document; designing and conducting terrestrial, riparian and wetland resource studies, reviewing and commenting on technical reports, and participating in public meetings. Meridian prepared study plans to measure fish attraction and collection efficiency of the trap and haul facility and downstream fish survival. Meridian's current assignment is to complete Exhibit E for inclusion in the FERC License Application. 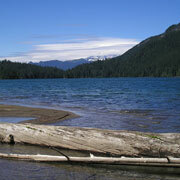 As a component of the Lewis River Project's Settlement Agreement and FERC License, Meridian developed a study plan and managed a comprehensive evaluation of bull trout habitat limiting factors in the tributaries to Lake Merwin and Swift Creek Reservoir; prepared a fish passage monitoring and evaluation plan designed to quantify collection efficiency, injury rates, and overall survival of juvenile and adult salmon and steelhead entering the Project surface collector and adult collection facility. 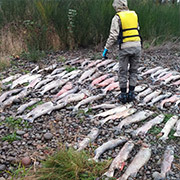 Meridian managed the preparation of a survey design to determine the distribution, abundance, and spawn time of transported anadromous fish in the Upper Lewis River and conducts upper Lewis River spawning surveys. Meridian also conducted an assessment of existing water temperatures, fish, and aquatic macroinvertebrates in the Yale Project tailrace as a component of the Project's Section 401 certification. Meridian is providing staff to operate the Swift Reservoir floating surface collector and Merwin Adult Trap fish passage facilities. Meridian is also conducting salmon spawner distribution and abundance surveys in the lower Lewis River for coho and Spring Chinook and seasonally operates screw traps to monitoring juvenile salmonid outmigration. Meridian assisted the District with preparation of draft FERC license applications for two 6-MW run-of-river hydro projects in the Cascade foothills. Meridian's responsibilities included analysis of project effects on aquatic and terrestrial resources, recreation, land use, aesthetics, and cultural resources. Both projects were licensed and are under construction. The new operating license for these projects required PGE to rebuild 8 and develop 5 new campgrounds, day use areas and river access sites located primarily in the Mt. Hood National Forest. Working with landscape architects, Meridian performed environmental analyses of the effects of work at each of these sites over a multi-year period. These analyses met the NEPA requirements of the Forest Service and the FERC, addressing ESA listed plants and animals, as well as aesthetic, recreation and Wild and Scenic River effects. Protective measures were identified to minimize and mitigate construction effects. Meridian also participates in trail planning, traffic analysis, construction permitting and annual reporting. 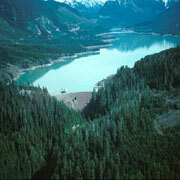 Meridian was the lead consultant for relicensing this 111.8-MW hydroelectric and municipal water supply project, advising the client on protection, mitigation and enhancement measures for the term of a new license, preparing the Preliminary License Proposal and the Final License Application, and completing biological assessments for both NMFS and USFWS. Since the project was licensed in 2011, we have continued to assist the District with implementing the license articles. Assignments have included designing, installing, and operating a screw trap and training District staff in on-going monitoring methods; completing a water temperature conditioning evaluation and report, and conducting a ramping rate study to assess the adequacy of current downramping rates on four Sultan River side channels.